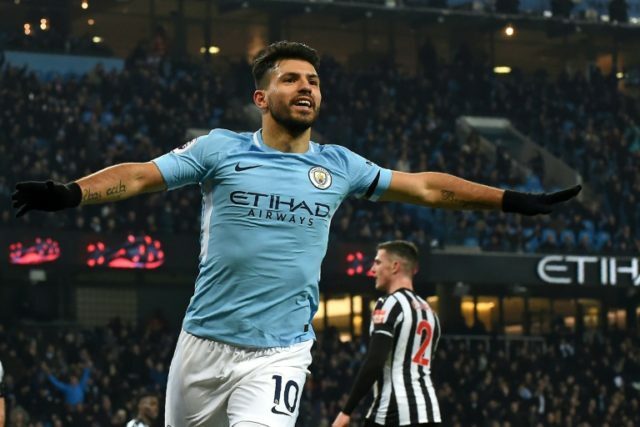 London (AFP) – Sergio Aguero scored a hat-trick as Manchester City restored their 12-point lead at the top of the Premier League with a 3-1 win at home to Newcastle United on Saturday. City’s 30-match unbeaten run in the league, which spanned two seasons, came to a dramatic end with a 4-3 defeat by Liverpool at Anfield last week. But their return to winning ways here had manager Pep Guardiola proclaiming his side needed 10 more victories to be crowned champions. Their advantage at the top of the table had been cut to single figures, for a few hours at least, when second-placed Manchester United beat Burnley 1-0 earlier on Saturday. Normal service resumed in the day’s late kick-off, though, with Aguero glancing in Kevin De Bruyne’s cross in the 34th minute to open the scoring at the Etihad. The Argentina striker then converted a 63rd-minute penalty awarded after Raheem Sterling tumbled in the box following a tug by Javier Manquillo. Aguero, however, put the result beyond doubt when City’s all-time leading goalscorer completed his 11th hat-trick for the club seven minutes from time following a superb run and pass from Leroy Sane. Meanwhile, Arsenal showed there was plenty of life after Alexis Sanchez as they beat Crystal Palace 4-1 without the United-bound Chilean forward. With Sanchez inching towards a £35 million (39.6 million euros, $48.5 million) transfer to United rather than City, Gunners manager Arsene Wenger left him out of his matchday squad. At Turf Moor, United striker Anthony Martial scored a 54th-minute winner with his third league goal in as many matches. Jose Mourinho left midfielder Henrikh Mkhitaryan, the proposed makeweight in the Sanchez deal, out of his matchday squad and afterwards the United manager indicated the transfer saga was nearing an end. Chelsea won 4-0 away to Brighton as the reigning English champions leapfrogged Liverpool, who play Swansea on Monday, into third place. The Blues’ first win of 2018 saw Eden Hazard score twice with a goal in each half, while Willian and Victor Moses were also on target. On a day when all Premier League fixtures were preceded by a minute’s applause honouring former West Bromwich Albion and England forward Cyrille Regis, a trailblazer for black players who died aged 59 last week, the Baggies drew 1-1 with Everton. Jay Rodriguez gave West Brom an early lead before Theo Walcott, on his Everton debut following a midweek move from Arsenal, laid on an equaliser for Oumar Niasse in the 70th minute. But the sight of Toffees midfielder James McCarthy going off with a broken leg cast a shadow over Everton boss Sam Allardyce’s 1,000th game as a manager. New Stoke manager Paul Lambert won his first game in charge of the Potters as they beat Huddersfield 2-0 with second-half goals from Joe Allen and Mame Biram Diouf to climb out of the relegation zone. Leicester beat Watford 2-0 while West Ham and Bournemouth drew 1-1. Tottenham Hotspur continue their quest for a Champions League place on Sunday against Southampton.